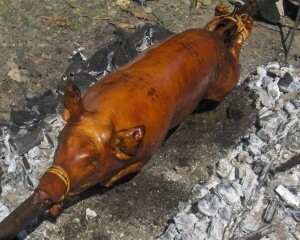 Hubby brought home two kilos of lechon (chopped roast pig) the other night courtesy of his boss. I cooked Lechon Paksiw the following day using the following ingredients. Lechon meat, crushed garlic, onions, vinegar, soy sauce, peppercorns, brown sugar, bay leaves, salt, water, lechon sauce (Mang Tomas). I place the chopped lechon meat in a casserole and put in all the ingredients except the lechon sauce. I let it boil and then stir it well. I add in lechon sauce and let it simmer for several minutes. It took me less than an hour to prepare this so I was able to still do other stuff in the kitchen. Lechon Paksiw is one of the favorite dishes Pinoys love to prepare on special occasions. This entry was posted in Recipe and tagged lechon paksiw, paksiw na lechon, roast pig on September 27, 2012 by Yami. Hello Fall $1000 Cash Giveaway! I’m going to use the prize money for the repair of our house. This entry was posted in Blog contest on September 22, 2012 by Yami. This entry was posted in Fruits, Weight watchers and tagged diet, fiber, fruits on September 18, 2012 by Yami.